Under-fire Leyton Orient manager Russell Slade was left clinging to his job despite seeing his side dominate a lively draw against Notts County. 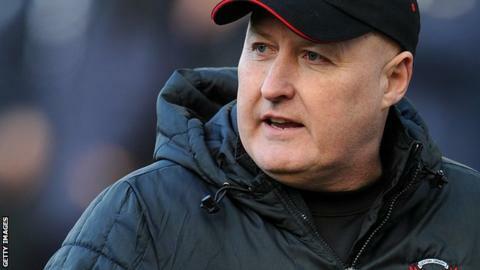 Slade had been told he would be sacked if he failed to oversee a win against the Magpies at Meadow Lane. And although his side responded with a spirited display, they trailed to Zeli Ismail's first-half penalty. The O's controlled the second half and equalised through Chris Dagnall's spot-kick, but were unable to find a winner. Bradley Pritchard came closest to earning three points for the visitors, only to rush his chance and smash a first-time effort wide from the edge of the box. "There was a frank and honest discussion about the way forward - which still involves me at this moment of time. We carry on - I carry on - in my role as it stands." Slade guided the O's to the League One play-off final last season, but a poor start to this season had seen them win just one of their opening six league games. And Orient's Italian owner Francesco Becchetti's patience was pushed to breaking point after Saturday's defeat against Colchester left them a point above the League One relegation zone. The performance on Tuesday was much improved and a lively and encouraging start saw Scott Cuthbert and David Mooney both miss good chances. But Notts led when Ismail, who earlier fizzed a fine shot just wide, found the bottom corner from the spot after Haydn Hollis was dragged down in the box by Nathan Clarke. The visitors played like a side desperate to save their manager after the interval, bossing possession and basing themselves in the Notts half. Within six minutes Dagnall's penalty made it 1-1 following Curtis Thompson's lunge on David Mooney, but despite staying in control for the rest of the game, Slade's side struggled to create many clear opportunities. O's substitute Darius Henderson wasted a good chance when he shot wide late on, while Liam Noble's rasping strike produced a fine save from Gary Woods in a rare home attack. At full-time, Slade went all the way across the pitch to applaud the fans after hugging most, if not all, of his players. The supporters were singing his name, but Slade's body language suggested he is convinced that this was his final match as Orient boss. "I felt at times we put them on the back foot, but they were a quality team. They had four players in the team of the year last season. "If we would have played them last year in this sort of a game we would have lost, but that shows what a bunch of lads we have here." "There was a frank and honest discussion about the way forward - which still involves me at this moment of time. "We carry on - I carry on - in my role as it stands. "These are challenging times for me and the group. We need to move on. We need to find a way to make it work. "I love my job and you don't want that taken away from you. I have still got a job to do. I still want to take the club to the Championship." Match ends, Notts County 1, Leyton Orient 1. Second Half ends, Notts County 1, Leyton Orient 1. Attempt saved. Zeli Ismail (Notts County) header from the left side of the box is saved in the top left corner. Darius Henderson (Leyton Orient) wins a free kick on the right wing. Foul by Louis Laing (Notts County). Attempt missed. Drissa Traoré (Notts County) right footed shot from outside the box is too high. Drissa Traoré (Notts County) wins a free kick in the defensive half. Jake Cassidy (Notts County) is shown the yellow card. Jake Cassidy (Notts County) wins a free kick in the attacking half. Zeli Ismail (Notts County) is shown the yellow card. Jobi McAnuff (Leyton Orient) wins a free kick on the left wing. Foul by Zeli Ismail (Notts County). Foul by Garry Thompson (Notts County). Attempt blocked. Darius Henderson (Leyton Orient) left footed shot from outside the box is blocked. Delay in match Jake Cassidy (Notts County) because of an injury. Shane Lowry (Leyton Orient) wins a free kick on the right wing. Attempt missed. Darius Henderson (Leyton Orient) left footed shot from the centre of the box is close, but misses to the left. Attempt saved. Liam Noble (Notts County) right footed shot from outside the box is saved in the top centre of the goal. Foul by Jake Cassidy (Notts County). Corner, Leyton Orient. Conceded by Roy Carroll. Substitution, Leyton Orient. Jay Simpson replaces Chris Dagnall. Corner, Notts County. Conceded by Nathan Clarke. Substitution, Notts County. Drissa Traoré replaces Alan Smith. Louis Laing (Notts County) is shown the yellow card. Substitution, Leyton Orient. Dean Cox replaces Michael Petrasso.